For the larger local government district, see Metropolitan Borough of Walsall. Walsall (/ˈwɔːlsɔːl/ ( listen) or /ˈwɒlsɔːl/) is a large industrialised market town in the West Midlands. Historically part of Staffordshire, it is located 8 miles (13 km) north-west of Birmingham, 6 miles (10 km) east of Wolverhampton and 9 miles (14 km) from Lichfield. Walsall is the administrative centre of the wider Metropolitan Borough of Walsall. At the 2011 census, the town's built-up area had a population of 67,594, with the wider borough having a population of 269,323. The name Walsall is thought to have derived from the words "Walh halh", meaning "valley of the Welsh speakers" (referring to the Brythons). Walsall is first referenced as 'Walesho' in a document dated 1002. Possibly as a result of a clerical error, it is not referred to in the Domesday Book, while the settlements of Aldridge, Bescot, Shelfield, Pelsall, Bloxwich, Great Barr and Rushall within the Metropolitan Borough are. However, it is believed that a manor was held here by William FitzAnsculf, who held numerous manors in the Midlands. By the first part of the 13th century, Walsall was a small market town, with the weekly market being introduced in 1220 and held on Tuesdays. The mayor of Walsall was created as a political position in the 14th century. Queen Mary's Grammar School was founded in 1554, and the school carries the queen's personal badge as its emblem: the Tudor Rose and the sheaf of arrows of Mary's mother Catherine of Aragon tied with a Staffordshire Knot. The town was visited by Queen Elizabeth I, when it was known as 'Walshale'. It was also visited by Henrietta Maria in 1643. She stayed in the town for one night at a building named the 'White Hart' in the area of Caldmore. The Industrial Revolution changed Walsall from a village of 2,000 people in the 16th century to a town of over 86,000 in approximately 200 years. The town manufactured a wide range of products including saddles, chains, buckles and plated ware. Nearby, limestone quarrying provided the town with much prosperity. In 1824, the Walsall Corporation received an Act of Parliament to improve the town by providing lighting and a gasworks. The gasworks was built in 1826 at a cost of £4,000. In 1825, the corporation built eleven tiled, brick almshouses for poor women. They were known to the area as 'Molesley's Almshouses'. The 'Walsall Improvement and Market Act' was passed in 1848 and amended in 1850. The Act provided facilities for the poor, improving and extending the sewerage system and giving the commissioners the powers to construct a new gas works. On 10 October 1847, a gas explosion killed one person and destroyed the west window of St Matthew's Church. Walsall finally received a railway line in 1847, 48 years after canals reached the town, Bescot having been served since 1838 by the Grand Junction Railway. In 1855, Walsall's first newspaper, the Walsall Courier and South Staffordshire Gazette, was published. The Whittimere Street drill hall was completed in 1866. Over 2000 men from Walsall were killed in fighting during the First World War. They are commemorated by the town's cenotaph: which is located on the site of a bomb which was dropped by Zeppelin 'L 21' – killing the town's mayoress, and two others. Damage from the Zeppelin can still be seen on what is now a club on the corner of the main road, just opposite a furniture shop. A plaque commemorates the incident. The town also has a memorial to two local VC recipients, John Henry Carless and Frederick Gibbs. Walsall's first cinema opened in the town centre in 1908; however, the post World War II decline in cinema attendances brought on by the rise in television ownership resulted in that and all of Walsall's other cinemas eventually being closed. The first Wurlitzer theatre organ in Great Britain was installed in the New Picture House cinema in Lower Bridge Street in the town centre. It was later renamed the Gaumont then Odeon. Slum clearances began after the end of World War I, with thousands of 19th-century buildings around the town centre being demolished as the 20th century wore on, with new estates being built away from the town centre during the 1920s and 1930s. These were concentrated in areas to the north of the town centre such as Coal Pool, Blakenall Heath (where Walsall's first council houses were built in 1920), Goscote and Harden. after the end of World War II, Beechdale. Significant developments also took place nearer to the town centre, particularly during the 1960s when a host of tower blocks were built around the town centre; however, most of these had been demolished by 2010. The Memorial Gardens opened in 1952 in honour of the town's fallen combatants of the two world wars. The Old Square Shopping Centre, a modern indoor shopping complex featuring many big retail names, opened in 1969. The Old Square shopping centre is currently laying derelict, with shops set to open in the centre soon. Primark and The Co-operative have opened in the former Tesco store, after the supermarket chained moved to Littleton Street by the college. A row of derelict shops were demolished in 2016, and rebuilt as a Poundland, which opened on Saturday 15 July 2017, and B & M, which opened on 17 August 2017. The Entertainer (Amersham) Ltd. also opened a store on 21 October 2017. The County Borough of Walsall, which originally consisted of Walsall and Bloxwich, was expanded in 1966 to incorporate most of Darlaston and Willenhall, as well as small parts of Bilston and Wednesbury. The current Metropolitan Borough of Walsall was formed in 1974 when Aldridge-Brownhills Urban District was incorporated into Walsall. At the same time, Walsall was transferred from the historic county of Staffordshire to become part of the new West Midlands county. The Saddlers Centre, a modern shopping mall, opened in 1980, being refurbished within a decade. On 23 November 1981, an F1/T2 tornado touched down in Bloxwich and later moved over parts of Walsall town centre and surrounding suburbs, causing some damage. The Jerome K. Jerome museum, dedicated to the locally born author (1859–1927), was opened in 1984. The town's prolific leather industry was recognised in 1988 when the Princess Royal opened Walsall Leather Museum. Walsall underwent modernisation in the 1970s with a new town centre being built at the expense of some medieval properties. In 1974, Walsall was transferred from the county of Staffordshire to form the metropolitan county of the West Midlands. The Saddlers' Centre, a modern shopping complex, was opened in the town centre in 1980. This included a new Marks & Spencer department store. Early 2000 saw the opening of The New Art Gallery Walsall in the north-west of the town centre near Wolverhampton Street, along with the new Crown Wharf Retail Park shortly afterwards. Part of Park Street, the town's main shopping area, was redeveloped around the same time. The centrepiece of this redevelopment was the new British Home Stores department store, which relocated from St Paul's Street at the end of the 1990s. Construction is[when?] ongoing in St Matthew's Quarters. A new Asda store opened in 2007 and when completed St Matthew's Quarters will also include brand shops and modern flats. Walsall College has moved to a new site within the town centre whilst on the old site Tesco has recently opened a new 10,000 sq ft (930 m2) shopping complex. The Savoy Cinema was a landmark on Park Street for more than half a century after its opening on 3 October 1938. It was refurbished in 1973 and became the Cannon Cinema after a takeover in 1986, but closed on 18 November 1993 after operating as a cinema for 55 years. It was demolished some 18 months later and the town's new Woolworth's store was built on its site. The store closed down at the end of 2008 when the retailer went into liquidation, and the building was re-occupied by a new T J Hughes department store which opened on 9 October 2009. However, the building became vacant again on 14 August 2011 when financial difficulties led to T.J. Hughes pulling out of the town after less than two years of trading. It was re-occupied two months later with the opening of a Poundland store in the building on 22 October that year. Walsall covers many areas of both Staffordshire and a section of Sandwell. The town has 6 towns in its borough, Willenhall, Bloxwich, Darlaston, Brownhills, Aldridge and Wednesbury (Only the Wood Green and the area around Darlaston). Many have also confused Walsall as being a city although this has been proven to be false. Despite it also covering larger areas such as Lichfield, Cannock, Rugeley and Hednesford. It remains an industrial town despite having a mass coverage of many towns and even a city as the postal code. 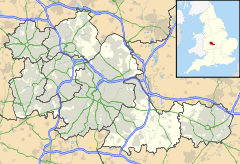 Walsall is also confused with being nearer to Birmingham although this is proven to be false as Birmingham's border does not start until after passing through Sandwell or the rural areas of Walsall-Birmingham. Walsall is actually closer to Wolverhampton as they are split by both Willenhall and Darlaston. These towns set the boundaries and joint ownership of Willenhall. Which is in Walsall but with a Wolverhampton postal code. Skip Lane looking east – parts of Walsall are semi-rural. Barr Beacon is on the horizon. A local landmark is Barr Beacon, which is reportedly the highest point following its latitude eastwards until the Ural Mountains in Russia. The soil of Walsall consists mainly of clay with areas of limestone, which were quarried during the Industrial Revolution. The 2001 Census gives the Walsall Urban Subdivision as the fourth most populous in the West Midlands conurbation, with a total resident population of 170,994. 80% Christian, 10% Muslim, 6% Sikh, 3% Hindu 1% Other. Within the Walsall urban area the distribution can said to be roughly, 60% Christian, 25% Muslim, 12% Sikh, 6% Hindu and 2% other. However the 2008 British Social Attitudes Survey (BSA) shows, in Britain, those who profess no-religion have risen from 31% to 43% between 1983 and 2008. In 2009, this was found to have further risen to 51%. Conversely, in 1983 66% identified as Christian. The Walsall dialect is often referred to as "Yam-Yam". The accent is often incorrectly referred to as a Brummie accent by people from outside the West Midlands. Walsall has had many industries, from coal mining to metal working. In the late 19th century, the coal mines ran dry, and Walsall became internationally famous for its leather trade. Walsall still manufactures the Queen's handbags, saddles for the Royal family and leathergoods for the Prince of Wales. Walsall is the traditional home of the English saddle manufacturing industry, hence the nickname of Walsall Football Club, "the Saddlers". Apart from leather goods, other industries in Walsall include iron and brass founding, limestone quarrying, small hardware, plastics, electronics, chemicals and aircraft parts. Walsall's location in Central England and the fact that the M6 runs through the Metropolitan Borough of Walsall has increased its investment appeal. The main RAC control centre is located in Walsall close by J9 of the M6 and there are now plans to redevelop derelict land in nearby Darlaston and turn it into a state-of-the-art regional centre. Between Bloxwich and Walsall there is a business corridor where TK Maxx has recently opened a regional depot. Currently established businesses include Homeserve plc and South Staffordshire Water. Walsall is home to the University of Wolverhampton's Sports and Art Campus and School of Education, all part of the Walsall Campus in Gorway Road, which includes a student village. Walsall College provides further education, and is based around three sites across Walsall. There are ten secular junior schools and two religious junior schools in the town of Walsall. Walsall also houses many secondary schools, including comprehensives, academies, private and grammar schools (Namely Queen Mary's Grammar School for Boys and Queen Mary's High School For Girls). The age of transfer to secondary school throughout the borough is 11 years, although the Aldridge-Brownhills area of the borough had a system of 5–9 first, 9–13 middle and 13–18 secondary schools until 1986, as the former urban district council of this area had adopted the three-tier system in 1972. Schools within the borough are administered by Walsall MBC.SERCO. Christianity is the largest religion in the Walsall Borough, shown in the 2011 census as 59.0%. The second largest is Islam recorded at 8.2%. Of the churches in Walsall, St Matthew's Church lies to the north of the town centre near the ASDA supermarket, and can be seen when entering Walsall in any direction where it is the highest structure. In 1821, St Matthew's Church was demolished with exception of the tower and chancel and replaced at a cost of £20,000 to a design by Francis Goodwin. St Martin's Church was consecrated in 1960 to serve the suburban housing estates of Orchard Hills, Brookhouse and Park Hall. Mellish Road Methodist Chapel, built 1910, had to be demolished in 2011, due to subsidence. Other churches in Walsall include: The Crossing at St Paul's, in the town centre, and the Rock Church, near the Walsall Arboretum. There are also numerous mosques or Masjids in Walsall. Most of these are in close proximity to each other, located in the adjoining areas of Caldmore and Palfrey, just south of the town centre. In the ward of Palfrey, there is Walsall's most-attended mosque, Masjid-Al-Farouq, alongside Aisha Mosque. Caldmore is home to four mosques: Masjid-e-Usman, Shah Jalal Masjid, Jalalia Masjid, and Ghausia Qasmia Mosque. In Chuckery, in the southeast of Walsall, lies Anjuman-e-Gosia Mosque and Jamia Masjid Ghausia is located in the Birchills neighbourhood. There is also a private Islamic school and Madrassah with 4 campuses across Walsall known as Abu Bakr Trust. Most mosques in Walsall also run their own evening Madrassahs. Walsall Bus Station is made up of two smaller bus stations, Bradford Place Bus Station and St Paul's Bus Station, one being larger than the other and providing more services. Over 90 bus routes operated by eleven bus operators serve Walsall. Services from St Paul's Bus Station leave Walsall in many directions; there are services south-east to Birmingham; west to Wolverhampton, Willenhall, north to Bloxwich, Cannock and Brownhills; and east to Sutton Coldfield and Aldridge, with many to the latter. In addition, more infrequent services run to Lichfield. St Paul's is also home to the Walsall Information Centre. Bradford Place mainly operates buses to the south and south-west, to West Bromwich, Oldbury, Dudley and Stourbridge. There are also numerous shorter bus routes leaving from both stations which give the town centre a link to housing estates including Alumwell, Beechdale, Chuckery, Park Hall and the Mossley Estate. Walsall railway station is situated on Station Street in the town centre and is also accessible from the Saddlers shopping centre. There are typically four trains per hour from the station to Birmingham and one train per hour to Rugeley with fewer trains in the evenings and on Sundays. There is also a suburban station at Bescot. Walsall is extremely well connected within the UK road network as it is served by the M6 which connects the M1 motorway towards London and M74 motorway towards Glasgow. There are three nearby junctions which serve Walsall on the M6 motorway: J7, J9 and J10. The stretch between these junctions is one of the busiest in Europe. The town is also served by A34 road which connects Manchester and the M42 motorway towards London, and is connected regionally by the A454 Black Country route. A tram service was erected in the town towards the end of the 19th century and ran until 2 October 1933. Walsall Aerodrome operated from the 1930s until 1956. The nearest airport to Walsall is Birmingham Airport, which is located within 30 minutes drive. The Midland Metro have currently got services that run from Wolverhampton St George's tram stop to Grand Central tram stop and soon the metro will run and operate a tram extension from north of the former Wednesbury Town railway station across Potter Lane to a stop near Brierley Hill which will see the metro line use the corridor from Wednesbury Town to Dudley before running street level and back onto the track at Canal Street before branching off to Merry Hill and a tram stop at Brierley Hill. The corridor section from Walsall to Wednesbury Town has been preserved for freight traffic to use to Round Oak Steel Terminal in the near future. It is possible that the metro extension will look to run an extension to Walsall via Bescot but will utilize the line with either people carriers or tram-trains. Walsall was also to be part of the former '5' Ws scheme which would have connected it to Wolverhampton, Wednesfield, Willenhall and Wednesbury. Walsall Council decided to pull Walsall and Willenhall out of the scheme in favour of reopening the line to Wolverhampton to passengers via Darlaston and Willenhall. A proposal for the new stations to be built is part of a wider investment strategy to improve local services. Walsall Arboretum was officially opened on 4 May 1874 by the wealthy Hatherton family. It was hoped that the park would provide "a healthy change from dogfights, bull-baiting and cockfights", however the 2d (old pence) admission was not popular with the public and within seven years the council took over ownership to provide free admission. Among the attractions available were two boating lakes on the sites of former quarries, tennis courts, an outdoor swimming pool, and later – in the extension – a children's play area and paddling pool. Over the years the Arboretum has seen many events and changes, including the beginnings of the Walsall Arboretum Illuminations as an annual event in 1951. Originally white bulbs in trees for courting couples in the autumn, in the 1960s and 1970s, the lights were purchased secondhand from Blackpool Illuminations, but over the years they were increasingly made "in house" and now all are. The Illuminations had up to sixty thousand bulbs and took year-round planning. Although the event had attracted an estimated 250,000 people in 1995, lack of growth beyond this figure has raised the prospect of major redevelopment as the light shows have been exactly the same for a number of years. In February 2009, Walsall council announced that the Illuminations would not take place in 2009, 2010 and 2011. In January 2010, it was announced that the Illuminations had been permanently scrapped and would be replaced by other events such as concerts and laser shows throughout the year. The existing lights would be sold off where possible to interested parties. The New Art Gallery Walsall opened in 2000. Named, as was its predecessor, the E M Flint Gallery in memory of Ethel Mary Flint, head of art at Queen Mary's Grammar School, an exhibitor at the Royal Academy, and a former mayor of Walsall, it contains a large number of works by Jacob Epstein as well as works by Van Gogh, Monet, Turner, Renoir and Constable. The large gallery space is host to temporary exhibitions. Walsall has two museums, Walsall Museum and Walsall Leather Museum. Walsall Museum features local history objects primarily from the manufacturing trades and also has a space for temporary exhibitions, while the leather museum displays a mixture of leather goods and has recreations of leatherworkers workshops. The refurbished Sister Dora statue stands at the crossroads of Park Street and Bridge Street. Opposite this stood a locally famous concrete hippopotamus, which has since been moved to a corner of the square and replaced by a fountain. The hippo was designed by local architect and sculptor John Wood. Though the novelist and essayist Jerome K. Jerome was born in the town, he never wrote about it. Some writers have, including the Walsall born John Petty (1919–1973) who set a number of his books in Walsall, most famously Five Fags a Day (1956). More recently the comic novelist Paul McDonald has used Walsall as a location for Surviving Sting (2001) and Kiss Me Softly, Amy Turtle (2004). Walsall's football club, Walsall F.C., the Saddlers, was founded in 1888 when Walsall Town F.C. and Walsall Swifts F.C. merged. They won their first game against Aston Villa. The club currently play in Football League One. There are also a number of non-league football clubs based within the borough. Most notably Rushall Olympic. Walsall has a cricket club, Walsall Cricket Club who won Birmingham League Premier Division in 2006. Walsall RUFC is Walsall's rugby union team which is currently competing in Midlands 1 West. Aldridge and Walsall Hockey Club currently plays in West Midlands Division One. Walsall was also once home to Formula 1 constructor Ensign Racing, in Walsall Wood from 1973 to 1980, before moving to Chasetown. Walsall was home to a horse racing course. The grandstand was constructed in 1809 at a cost of £1,300 on a piece of land donated by the Earl of Bradford on a lease of 99 years. Soon after completion, one of the lower compartments was converted into a billiards room, which contained a table donated by Lord Chichester Spencer of Fisherwick Park. Throughout the 19th century, races were held annually at the racecourse at Michaelmas. In 1809, a market house was constructed at the end of High Street, on the site of the market cross, for the sale of poultry, eggs, butter and dairy produce. The building was demolished in 1852 along with other buildings that had fallen into disrepair. A pig market was constructed in the town in 1815 on High Street. At its peak, the market would handle the sale of 2,000 pigs per day. In 1847, the corporation tried to construct a new market hall on the 'Bowling Green', to the rear of the Dragon Inn. The scheme proposed to use a large amount of public money to construct the hall. Shopkeepers feared that their businesses would be affected and demonstrations were held across the town against the proposals. The demonstrations forced the plans to be shelved. Walsall town centre is fast becoming the most popular shopping destination in the Black Country. This is due to the ample supply of free or extremely cheap parking available within the town centre. This is primarily due to two large 24 Hour supermarkets; Tesco and Asda, located on opposite sides of the town centre, not charging for parking all day. Crown Wharf Retail Park remains the most popular area of shopping. It houses the first non-food Asda store named Asda Living as well as popular shops and restaurants such as Outfit, Smyths Toys, Bank, T.K. Maxx, River Island, Next, Peacocks, Starbucks and Nando's. Park Street remains Walsall's main shopping high street. Well-known retailers such as New Look, Marks & Spencer, Deichmann, USC and Primark are all located on this fully pedestrianized high street. There is one main shopping mall 'Bradford Mall' formerly known as the 'Saddlers Centre' and two smaller malls located in the town centre. 'The Old Square' shopping mall houses Debenhams and other smaller retailers while 'Quasar Centre' now known as 'Park Place Shopping Centre' houses Wilko's and the other smaller retailers. Other shopping destinations include Broadwalk Retail Park and Reedswood Retail Park. The area around Walsall Art Gallery is under redevelopment. A new Premier Inn hotel has opened along with an 8 screen The Light Cinemas in addition to popular restaurants such as PizzaExpress, TGI Fridays and Bella Italia . There is also a second cinema to be opened across the road opposite Tesco which will also house popular restaurants. Projects due for completion in 2009 and 2010 include Walsall Manor Hospital redevelopment worth £174 million, the new Walsall College worth £65 million, the Waterfront South development worth £60 million and the St. Matthew's Quarter worth more than £25 million. Other projects with approval include £500 million Walsall Gigaport which is a high-speed fibre optic internet environment for national and international businesses, Waterfront North development worth £65 million and the Waterfront Lex development. Walsall Transport Package worth £17 million was also due for completion in 2009 but was actually completed earlier, allowing the early opening of a £55 million supermarket development to create scores of extra jobs. This is an overall development of roads in and out of Walsall town centre as well as those towards Walsall Arboretum. John Henry Carless VC (1896 in Walsall – 1917) recipient of the Victoria Cross during the First World War. Sir Terence Beckett KBE (1923 in Walsall – 2013) businessman, chairman of Ford and later became director-general of the Confederation of British Industry. Sir Len Peach (1932 in Walsall – 2016) Chief Executive of the National Health Service 1986 - 1989. Matthew Marsden (born 1973 in West Bromwich) stage and film actor, brought up on the Yew Tree Estate in Walsall and schooled in Wednesbury and Great Barr. Jeffrey Holland (born Jeffrey Michael Parkes, 1946 in Walsall) actor, roles in TV sitcoms and in Hi-de-Hi!, attended Queen Mary's Grammar School. Peter Corey (born 1946 in Walsall) author of the Coping With children's book series also a TV actor. Dave Walker (born 1945 in Walsall) singer and guitarist, front-man for a number of bands; most notably Idle Race, Savoy Brown, Fleetwood Mac, and, briefly, Black Sabbath. Noddy Holder MBE (born 1946 in Caldmore) musician and actor, lead singer and guitarist in glam rock band Slade, attended T.P. Riley Comprehensive School in Bloxwich and became a Freeman of the borough of Walsall in 2014. Leila Williams (born in Walsall 1937) Beauty Queen and Blue Peter presenter from 1958 until 1962. Alex Lester (born 1956 in Walsall) radio broadcaster, from October 2014 until January 2017, he presented the Radio 2 midnight to 3 am programme every Friday, Saturday and Sunday. Colin Charvis (born 1972 in Sutton Coldfield) attended Queen Mary's Grammar School in Walsall, a former captain of the Wales national rugby union team and also played for the British and Irish lions. Now owns a carpet shop in Swansea. Dean Keates (born 1978 in Beechdale) retired footballer & currently First Team manager of Walsall. Lee Naylor (born in 1980 in Mossley) former professional footballer who previously played for Wolverhampton Wanderers, Celtic, Cardiff City, Accrington Stanley & Derby County. ^ "All UK Towns & Cities in Population Order (2011 Census)". LoveMyTown. Retrieved 9 September 2013. ^ "KS101EW – Usual resident population". 2011 census. nomis – official labour market statistics. Retrieved 9 September 2013. ^ a b Glesson, Mike (2009). "A Walsall Timeline" (PDF). Walsall: Walsall Metropolitan Borough Council. Archived from the original (PDF) on 22 June 2010. Retrieved 22 June 2010. ^ Edward Lees Glew (1856). History of the Borough and Foreign of Walsall. J.R. Robinson. p. 3. ^ a b Arthur Freeling (1838). Freeling's Grand Junction Railway Companion to Liverpool, Manchester and Birmingham. p. 125. ^ Edward Lees Glew (1856). History of the Borough and Foreign of Walsall. J.R. Robinson. p. 9. ^ a b Arthur Freeling (1838). Freeling's Grand Junction Railway Companion to Liverpool, Manchester and Birmingham. p. 126. ^ Edward Lees Glew (1856). History of the Borough and Foreign of Walsall. J.R. Robinson. p. 28. ^ a b Edward Lees Glew (1856). History of the Borough and Foreign of Walsall. J.R. Robinson. p. 15. ^ Edward Lees Glew (1856). History of the Borough and Foreign of Walsall. J.R. Robinson. p. 21. ^ "Walsall". The Drill Hall Project. Retrieved 4 September 2017. ^ "Walsall – The growth of the town | A History of the County of Stafford: Volume 17 (pp. 146–165)". British-history.ac.uk. Retrieved 18 May 2014. ^ "New homes for sale in Walsall – new homes for sale – Zoopla". Findanewhome.com. Retrieved 18 May 2014. ^ a b "A History of Walsall". Localhistories.org. Retrieved 18 May 2014. ^ "Walsall Station to Walsall M&S (13) | Flickr – Photo Sharing!". Flickr. 2 July 2010. Retrieved 18 May 2014. ^ "'A Pebble on Water' by Rowan Moore « Caruso St John Architects". Carusostjohn.com. Retrieved 18 May 2014. ^ "Cannon Walsall in Walsall, GB". Cinema Treasures. Retrieved 18 May 2014. ^ "Woolworths store to be reborn". Express & Star. 27 July 2009. ^ "Closure dates named for TJ Hughes stores". Express & Star. 5 August 2011. ^ Edward Lees Glew (1856). History of the Borough and Foreign of Walsall. J.R. Robinson. p. 5. ^ "Climatological Information for Walsall, United Kingdom", Near Rough Wood Station, 2018. Web: . ^ "KS06 Ethnic Group: Census 2001, Key Statistics for urban areas". National Statistics. Retrieved 16 February 2009. ^ "KS06 Ethnic group: Key Statistics for urban areas, summary results for local authorities". National Statistics. Retrieved 16 February 2009. ^ Edward Lees Glew (1856). History of the Borough and Foreign of Walsall. J.R. Robinson. p. 20. ^ "Salvaged Walsall chapel spire goes on sale at Britain's quirkiest fair for £130k starting price". Walsall Advertiser. 22 June 2015. Archived from the original on 23 June 2015. Retrieved 22 June 2015. ^ "Welcome to Masjid-Al-Farouq, Walsall". masjidalfarouq.org.uk. Retrieved 2016-06-25. ^ "About Us - Aisha Mosque & Islamic Centre". Retrieved 2016-06-25. ^ "Shahjalal Masjid and Madrasah in Walsall for Boys and Girls". www.shahjalal.org. Retrieved 2016-06-25. ^ "Our Century 1925–1949". Expressandstar.com. 2 October 1933. Retrieved 18 May 2014. ^ "Helliwells aircraft component factory at Walsall airport". Black Country Bugle. 25 November 2010. Archived from the original on 28 September 2011. Retrieved 19 May 2013. ^ "Airfield; S of Aldridge". Black Country History. Retrieved 19 May 2013. ^ "At last New Willenhall Railway Station plan backed after years of campaigning". Express & Star. ^ "Walsall Virtual Arboretum". Walsall MBC. ^ "Walsall Illuminations 2006". Walsall MBC. ^ "Walsall Illuminations 2005". BBC. ^ "Final chance for Illuminations". Express and Star. ^ "Light are turned off in crunch". Express and Star. ^ "Illuminations scrapped for Good". Express and Star. ^ Geoff Harvey; Vanessa Strowger (2004). Rivals: The Off-Beat Guide to the 92 League Clubs. Aesculus Press Ltd. p. 178. ISBN 1-904328-13-X. ^ "People – Brownhills near Walsall West Midlands". Members.madasafish.com. Retrieved 18 May 2014. ^ "Laurahird.com". Laurahird.com. Archived from the original on 29 October 2013. Retrieved 18 May 2014. ^ Edward Lees Glew (1856). History of the Borough and Foreign of Walsall. J.R. Robinson. pp. 30–31. ^ Edward Lees Glew (1856). History of the Borough and Foreign of Walsall. J.R. Robinson. p. 16. ^ Edward Lees Glew (1856). History of the Borough and Foreign of Walsall. J.R. Robinson. p. 17. ^ "Walsall Regeneration Company". Walsall-regeneration.co.uk. Retrieved 18 May 2014. ^ "Walsall Redevelopments". Walsall.gov.uk. Retrieved 18 May 2014. ^ "Walsall Express & Star". Expressandstar.com. Retrieved 18 May 2014. ^ Gibbs, Frederick (11 January 1917). "Lieutenant" (Notable Residence received VC). London Gazette. London Gazette. ^ "Black Country – Features – From Saddles to Chuckles". BBC. 25 January 2008. Retrieved 18 May 2014. ^ "Twin town – Mulhouse". Cms.walsall.gov.uk. Archived from the original on 13 October 2011. Retrieved 18 May 2014. "Walsall" . Encyclopædia Britannica. 28 (11th ed.). 1911.